Moments from Santee lies one of the area’s true golfing gems, Shannon Greens. 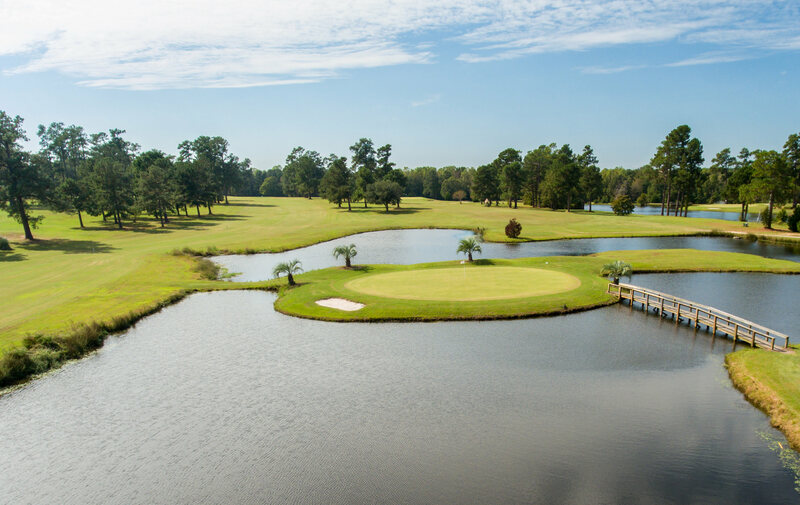 Experience Shannon Greens’ newly designed 16th hole – The Island Green. Golfers will enjoy the beauty of this hole from all four tees. The remaining 17 holes meander through tall California Pines and over rolling terrain. Shannon Greens is a shotmaker’s delight offering golfers the chance to hit every shot in the bag. A fairly open and forgiving layout presents an opportunity for a great score. Everyone is suer to enjoy a trip around this great golf course. From Santee rake I-95 north to exit 119. Coming off the ramp move over to the right towards Manning. Stay on the road for 2.5 miles. Take a right on Bloomville Hwy. (Sunoco gas station) Go 1/4 of a mile down Bloomville Hwy. The entrance to Shannon Greens will be on your right side. Features: Pro Shop, Banquet Hall, Bar, Putting Green, Driving Range, Carts, Lessons and Club rentals. Dress Code: Proper golf attire required. All mens shirts must have sleeves. Denim is permitted, however, no cut-offs. Ladies may wear sleeveless shirts. No metal spikes allowed. Cooler Policy: Allowed on golf course. No glass, please.